The Collegian April 1915, page 4. Miss Flora le Cornu (later Landells) was one of the founding teachers that MLC bought in, initially as a visiting teacher of painting and drawing. A passionate teacher of art, girls from her classes spoke excitedly of being able to use Mrs Landells' studio rather than the school hall, and of her enthusiasm for studies of wildflowers in oils and watercolours, a design motif which Flora would later experiment with in her own pottery. By the 1930s, Flora's interest was firmly established in pottery. Working from her home studio in Inglewood, a suburb north of Perth, Flora created and decorated pottery using clays and glazes prepared by her chemist husband, Reg Landells. Clays were sourced from Popanyinning, Kalamunda, Mount Lawley and Collie, with glazes from felspar, flint, potash, lime and white lead. Colours came from oxides of metals found in Western Australia. 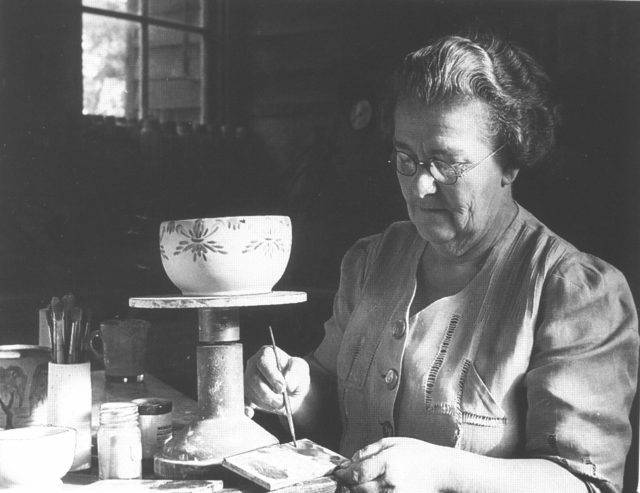 While Flora would continue to exhibit in watercolour, by the time her second pottery exhibition was opened by Chief Justice Sir John Dwyer at Newspaper House in 1947, Flora's reputation as a significant artist had already been cemented. A vase purchased in 1936 was the first piece of WA studio pottery to be acquired by the Western Australian Art Gallery. In 1982, The Flora Landells Art Centre was opened as part of a major addition to the Centenary Building. It was relocated in 2003 to Langsford House. In 2009 the art room moved to the Middle School Building. Works held in the MLC Archive collection by Flora Landells can be viewed in the College's main reception in the Centenary Building.